I'm starting a new monthly series in which I will give brief review of all of the books I read in that month. It's a fun way for me to better remember the books I've read, and I hope that it will give you a few ideas if you're looking for some book recommendations! You should know that I am pretty stingy in giving out a 5-star review; it has to be an absolutely amazing, I want to re-read it, I can't stop talking about it kind of book in order for it to be 5 stars. 4 stars means that I really liked it and down on from there. Also please remember that book preferences and tastes are very personal; you and I might not agree on which books are great and which aren't, so take each of my reviews and ratings with that in mind. There was a lot of sickness in our household in the month of April, so we spent a lot of time at home which means I spent a lot of time reading! So - here are the 13 books that I read in April! The Paris Architect: A Novel // I have always really enjoyed reading historical fiction, and this was no exception. 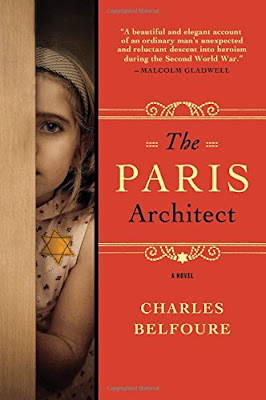 Unlike many of the World War II historical fiction books that I've read, this was actually about a French architect who was unsympathetic toward Jews. The first chapter was quite difficult to read because of that, but beyond that I really enjoyed this book. The story was unexpected and well-written. I won't give anymore of the story away, but it was a good read! 4 stars. Opening Belle // This was an easy, mindless read that I admit I enjoyed for the first third of the book. It's about a woman working on Wall Street in 2007, struggling to do it all and be it all, and fighting to break through the glass ceiling. At first there are some thought-provoking aspects to the story--being a woman in a male-dominated industry, a woman trying to juggle being a mother and also the primary breadwinner, the glass ceiling, the subprime mortgage crisis and stock market crash in 2008, etc. But about a third of the way through, the whole book just kind of loses steam, and I didn't like it after that point. The plot wasn't strong enough, I didn't like any of the characters, and I didn't like the ending. Just not my favorite. 2 stars. The Two-Family House // I really, really enjoyed this book! It's a beautifully written story about two families (the husbands are brothers) that spans a couple of decades. The chapters are all written from several different points of view (the husbands, mothers, and daughters), and it was a really enjoyable read. I loved the family dynamics and relationships that the author explored in this story, and it was quite moving in some parts. The family experiences things that most families experience at some point: celebration, tragedy, change, strained relationships, poor communication, etc. As a mother I especially enjoyed reading it, but I also appreciated reading it as a wife, daughter, and sister. 4 stars! Brazen: The Courage to Find the You That's Been Hiding // This book is all about living without shame and allowing yourself to be your true self. While the message of this book did not entirely speak to me as this is not something that I personally have a difficult time doing, I do think that this book could be helpful for others who do struggle with this! There are a lot of personal examples the author shares that are interesting and easy to read. I give this 3 stars because I personally didn't benefit a whole lot from the book, but it's worth picking up if this is something that you're interested in! When Breath Becomes Air // This is such a powerful book! I'm sure by now you've heard of it in about 17 different places, but it really is worth the read. It's the memoir of a neurosurgeon who finds out he has terminal lung cancer in his mid-thirties. It's beautifully written, and as Paul faces death he wrestles with big questions that are really critical for each of us to think about. It is a deeply emotional and raw book. 4 stars. The Bette Davis Club // This was the book for my book club this month. We wanted something a bit lighter after our two previous reads (Room and The Pecan Man), which had the heavier elements of kidnapping, death, and racism. This was definitely a light read! The story follows Margo Just and her cross-country trip in search of her niece and the family valuables she's stolen. There's a lot of drama, a little bit of romance, and a little bit of humor. Our book club's general consensus was that it was not as funny as we expected it to be, but it was a very enjoyable read. This would be a good beach read. 3.5 stars. Keep Me Posted// I was able to read this book through NetGalley and really enjoyed it! This book is about two sisters who decide to start communicating via snail mail. The sisters are both quite transparent in their letters to each other about their struggles in marriage, with their kids, and in their lives in general. Through a strange mishap, all of the letters are made public on the internet, and the sisters have to deal with their personal lives suddenly going viral. I thought this book was pretty funny, mostly because I loved the say-it-like-it-is attitude of the narrator. It was a really easy read, and I finished it in just a couple of settings. 4 stars. Better Than Before // I love Gretchen Rubin's books, and this one was no exception. It was a really interesting read on how we make, keep, and break habits. There were interesting tips and tricks and also fascinating chapters on personality types and tendencies. I kept reading different parts out loud to Caleb, and we actually had a few conversations about what I read and learned. I loved this book so much I wrote an entire blog post on it, which you can read here. 5 stars! The Nest // If you love reading about dysfunctional families, this book is for you. The four Plumb siblings each have a slew of personal problems that they expect their inheritance of "The Nest" will solve. When that's put at risk by an idiotic mistake of one of the brothers, they are all scrambling to put their lives right. I enjoyed reading this book, and I liked how all of the storylines and chapters of the different family members and friends fit well together It was definitely an enjoyable read, and I'm glad I read it. 3.5 stars. Everyone Brave is Forgiven // This book comes out on Tuesday, and I was lucky enough to read an advanced reader copy through NetGalley! Chris Cleave is such a talented writer (Little Bee is one of my all-time favorite books), and his latest work is no exception. He writes so beautifully that even as a work of fiction it is incredibly moving. His characters are so real (and flawed) and quite engaging. The book traces the lives of several people during World War II. As far as World War II fiction goes, this was once again an unexpected story, which I appreciated. It has some heavier themes and at times is absolutely heartbreaking, but I read it in a couple of days and really enjoyed it. 4 stars. 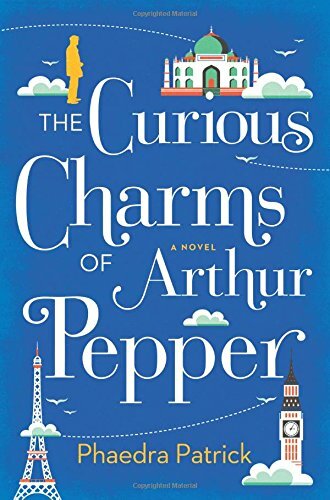 The Curious Charms of Arthur Pepper // Somewhere on the internet I saw this book listed as June's Indie Next Pick, and I thought it sounded like such a fun book. This book also comes out on Tuesday, but I was able to receive an advanced reader copy through NetGalley, and I loved it! The story is about a widower who finds a charm bracelet of his wife's he had known nothing about. He's determined to learn the story behind each charm, and as he does he discovers all these things about his wife's past he never knew. He learns a lot about his wife but also about himself, and it's a really great book. It's a cute, quirky story, and if you liked The Rosie Project , then you will also really enjoy this book! 4 stars. The Forgotten Room // I picked this book up because I have really enjoyed most of Beatriz Williams' books, and she is one of three authors of this book. The story is about three women set in alternating time periods who are all connected to one room in a mansion in Manhattan. Because each chapter alternates between each woman's story, the plot and storyline are a little bit predictable as you pick up on hints throughout each chapter. Even so, I found this to be a very fast read because I wanted to know more details of what happened. I thought it was very seamlessly written for having three authors, as well. 4 stars. Eligible // This book is part of the Austen Project--modern retellings of Jane Austen's works. This is the first book of the Austen Project that I've read, but I believe next I will be picking up Emma by Alexander McCall Smith! Pride and Prejudice is my favorite Jane Austen book and one of my favorite classics. It's no surprise, then, that I absolutely loved this book that I was able to read through NetGalley! 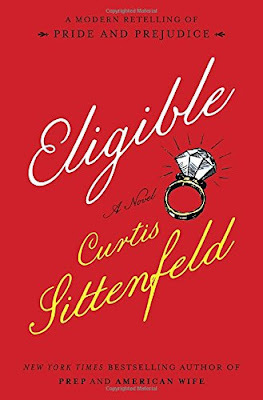 I thought Curtis Sittenfeld did an excellent job putting the same characters from Pride and Prejudice into a modern day setting. I couldn't put this book down and stayed up way too late finishing it. This is a spring/summer must-read! 5 stars! Have you read any of these? What have you been reading this past month? I always love hearing book recommendations from others! I read the Light Between Oceans and loved it!! Oh that is a good one!! Girl... you read so many books. I am so impressed. I love how stingy you are with your stars - I've noticed that on goodreads, haha. I know if you give something 5 stars you must really like it!! I need to be better about that... I'm always like, ahhh it was great, 4 stars. I'm going to need to pick up Better than Before, it sounds like something I'd love. I need to learn about Habits too haha. This reminds me I still am meaning to send you that Myers Briggs info... sorry about that! One day. I've never read none of them. I need to read more books. thanks for sharing, now I know where to start. I'll try to read these books. Thanks for indication!